The 3D features in Illustrator come in handy when creating logos, illustrations, and other graphic elements. I’ve found experimenting with different settings within the 3D Options dialogs, can yield some unexpected but welcoming results. When experimenting with the 3D options, sometimes it is frustrating trying to get back to the original settings without closing the dialog. But there is an easy answer! 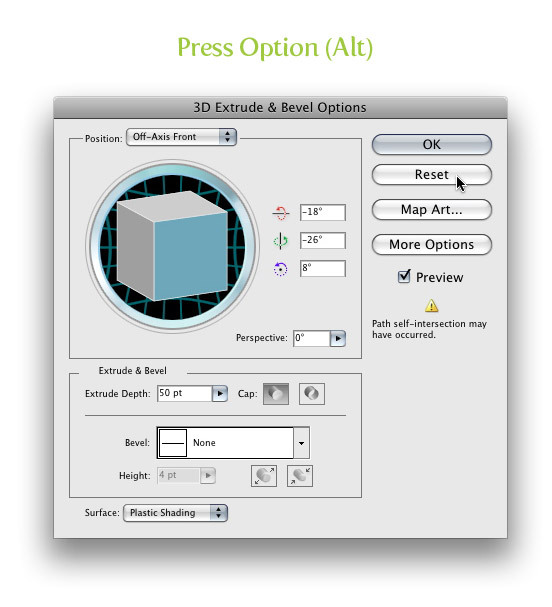 An extremely quick way to reset the 3D option within a 3D Options dialog, is to press the Option (Alt) key. Once pressed, the Cancel button turns into a Reset button and pressing the button will reset the values to when you first opened the dialog. Not quite an earth shattering tip, but some of you will find this very helpful! Wish I’d read this yesterday. Somehow I’ve never come across this bit of info. Thanks for the tip. This is pretty simply but still good for newer folks in design. By the way, at least in photoshop, if you are using, for instance, “Curves (image adjustments)”, then if you press ctrl + alt + M, then you’ll get the some settings from the last time. You can do it in different layers also. This also works for every other dialog in the adobe suite as far as i know. Holding ALT to reset made options in a dialogbox works for almost all Adobe Applications!!! This tip works in all the dialogs in all the Adobe CS apps.